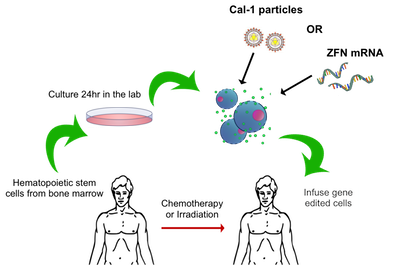 Scheme for functional HIV cure by gene therapy/gene editing. Hematopoietic stem cells are harvested and genetically engineered to be HIV resistant. Genetic manipulation can be achieved with engineered viruses (Cal-1 particles) or using zinc finger nucleases. Non-modified stem cells in the bone marrow are ablated with chemotherapy or irradiation, which allows the genetically engineered HIV resistant stem cells to engraft. With modern advances in combinatorial antiretroviral therapy (ART), HIV infection has become a manageable latent infection for many patients. This has largely extended patient lifetimes; however, in rare cases ART is not effective. Additionally, despite response to ART ongoing co-morbidities compromise lifespan. Thus researchers are working towards functional cures, where even in the absence of ART no HIV particles are produced in patient blood. Such a cure was reported after hematopoietic cell transplantation for AML. Thus members of the Kiem lab in the Clinical Research Division are working towards an autologous (from the subjects own marrow) transplant using genetically engineered, HIV resistant stem cells. With the rich history of marrow and stem cell transplant, Fred Hutch doctors and researchers are particularly well suited to pursue this approach. Drs. Chris Peterson (research scientist), Kevin Haworth (postdoctoral fellow), and colleagues in the Kiem lab genetically modify stem cells to resist HIV infection. Two unique methods were used to achieve this gene editing, and were recently published in the journals Molecular Therapy  Methods & Clinical Development and Blood. The first approach used to modify hematopoietic stem cells was actually to hijack HIV itself. When HIV infects human cells it inserts its own genes into human chromosomes, understanding this mechanism allowed scientists to exploit it for therapeutic uses. With standard molecular biology techniques, researchers replace the HIV genes with therapeutically relevant genes, then these engineered viral particles insert into human chromosomes. Cal-1, the therapeutic agent in this study, produces a small peptide after it has been inserted into the human cells and prevents HIV from fusing with the host cell, thus stopping infection. The first step in establishing this new therapy was to show that the transplanted cells persisted, and were safe. Drs. Peterson and Haworth modified hematopoietic stem cells with Cal-1 and then determined how long the cells persisted in a clinically relevant animal model. Dr. Peterson outlined the approach for these experiments, "We evaluate all of our gene therapy methods in two ways. First, we perform transplants in an uninfected setting. This allows us to focus on the safety of the gene therapy intervention on its own, and optimize the protocol for engineering and engrafting the cells. Once that is established, we can then apply the identical therapy in infected subjects." For these initial studies, the gene therapy-modified cells were followed for up to six months after transplantation. No adverse events were observed during this period, and the Cal-1 modification was maintained in blood cells after this long time point. Excitingly, this gene modification was present not just in stem cells, but in many differentiated cell types. This differentiation is essential for Cal-1 to provide HIV protection, because HIV targets differentiated cells, such as T cells. Another safety concern when using this hijacked HIV mechanism is that the engineered virus inserts semi-randomly into human chromosomes; this could negatively affect the patient if it compromises normal growth and differentiation. If this were the case, a less diverse set of insertion sites would be observed over time. In this study researchers observed a high diversity of insertion sites were maintained immediately following transplant up to six months later. The modified stem cells demonstrate resistance to HIV infection as well. Following infection with a virus closely related to HIV, Cal-1 cells outcompeted non-modified cells and increased their representation in bone marrow. There are many approaches to modify the human genome. For their other study, researchers in the Kiem lab employed zinc finger nucleases (ZFNs) to target HIV receptors with a gene editing strategy. ZFNs are engineered to target a very specific site of DNA and induce a double stranded break. If the error prone non-homologous end joining pathway rejoins these strands, it often causes a premature truncation of the gene product, resulting in a nonfunctional protein. Previous work found that loss of the cell surface protein CCR5 decreases HIV infectivity because CCR5 is one of the biomolecules HIV binds to enter cells. Thus ZFNs targeting CCR5 were used to delete this protein in hematopoietic stem cells. The safety of this gene editing approach was evaluated similarly to Cal-1 modified cells. CCR5 deletion could be detected more than six months after transplant in multiple progenitor cell types. The CCR5 targeting also resulted in a large diversity of deletion sequences, which were maintained over time, again suggesting no modifications were adversely affecting stem cell health. These early studies truly are cutting edge, as Dr. Hans-Peter Kiem commented, "This was the first time that nuclease-mediated genome-edited stem cells have been shown to engraft and provide multilineage constitution of the blood and immune system. These finding have important implications for other nuclease-mediated gene editing approaches e.g. using CRISPR/Cas technology and other genetic disease like sickle cell disease or thalassemia." These studies demonstrate the exciting future of gene therapy and gene editing to improve human health. They also emphasize how therapeutic approaches may overlap between unique diseases, and the value of expanding our focus at Fred Hutch beyond cancer. Peterson CW,Haworth KG,Burke BP,Polacino P,Norman KK,Adair JE,Hu SL,Bartlett JS,Symonds GP,Kiem HP. (2016). Multilineage polyclonal engraftment of Cal-1 gene-modified cells and in vivo selection after SHIV infection in a nonhuman primate model of AIDS. Mol Ther Methods Clin Dev, 3, 16007. Peterson CW, Wang J, Norman KK, Norgaard ZK, Humbert O, Tse CK, Yan JJ, Trimble RG, Shivak DA, Rebar EJ, Gregory PD, Holmes MC, Kiem HP. (2016). Long-term multi-lineage engraftment of genome-edited hematopoietic stem cells after autologous transplantation in nonhuman primates. Blood. ePub ahead of print. Funding for this research was provided by the National Institutes of Health, Calimmune, and the Markey Molecular Medicine Center.